We are currently buying Raimonds Staprans paintings. Please email images, dimensions and details to modernart@gmail.com Additionally, please let us know if you would like to see newly available Raimonds Staprans artworks as they become available. Raimonds Staprans (Latvian: Raimonds Staprāns) is a well-known artist and playwright both in the United States and his native Latvia. Staprans was born in 1926 in Riga, Latvia. He now lives in San Francisco, California with his wife, scientist Ilona Staprāns. He has two daughters, Maretta Staprāns-Barlow and Alda Staprāns-Mednis. 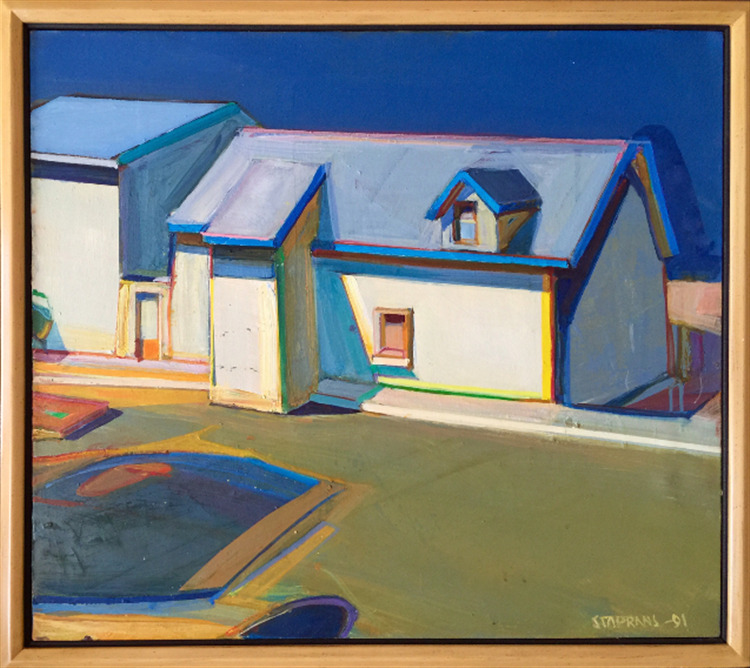 After living in occupied Latvia and in a Displaced Persons camp during World War II, Staprans immigrated to the United States with his family in 1947. He studied art at the University of Washington under Alexander Archipenko and Mark Tobey, then moved to the San Francisco Bay Area to begin graduate studies at the University of California, Berkeley. He studied with Hans Hofmann and Karl Kasten, among others, and graduated with a Masters of Fine Arts in 1954. 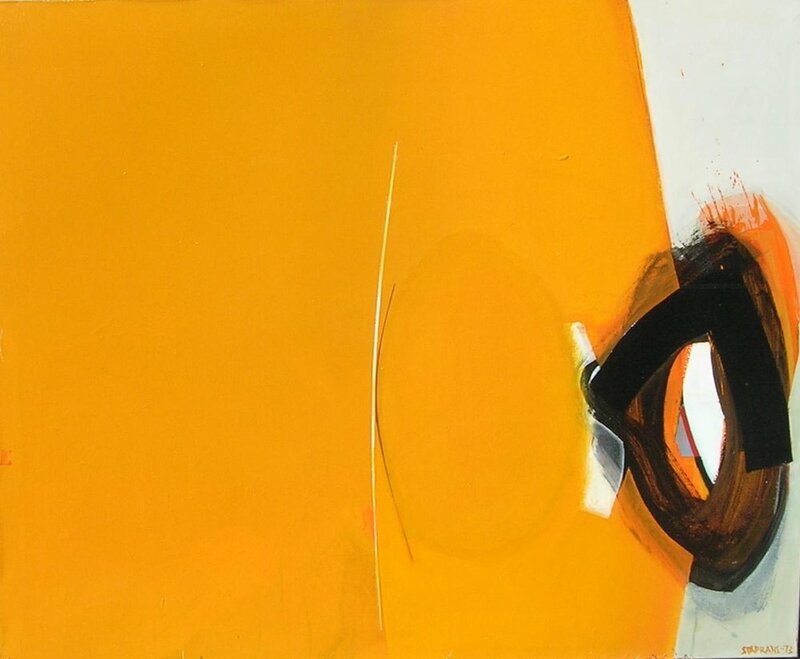 Staprans' work is held in the permanent collections in the Fine Arts Museums of San Francisco, the Los Angeles County Museum of Art, the San Jose Museum of Art, and the Portland Art Museum, among others. A career retrospective of his art opened at the Pasadena Museum of California Art in March, 2006, was shown in San Francisco and traveled to Riga, Latvia where it was exhibited in the Latvian National Museum of Art later that year. Staprans' skillfully constructed still life and landscape paintings are notable for the artist's sensitive response to light and color. A recent review of his work exhibited in Los Angeles compared the "tasteful seriousness" of his paintings to that of Cézanne. Staprans is said to examine the "architecture" of everyday objects in his art using explosive color and flattened compositions, creating a "tension between representation and abstraction that plays with viewers' expectations." Staprans is also an accomplished playwright. Most of his plays are set in Latvia during the 20th century. His play "The Freezing" was produced in 1979 by the San Francisco Little Theater and the Latvian National Theater in 1980. His 1989 play, "Four Days in June", depicted the Soviet occupation of Latvia in 1940. It was performed in Riga to more than 100 sold-out audiences, and later won first prize in the Baltic Theatre Festival. "Four Days in June" is regarded as having played an integral part in the pro-democracy movement in Latvia during the momentous changes following the end of the Soviet Union. In 2003, Staprans was awarded Latvia's highest civilian honor, the Order of the Three Stars, the Latvian equivalent of the United States Presidential Medal of Freedom. An extensive interview with Raimonds Staprans was conducted by the Archives of American Art, Smithsonian Institution, by Paul Karlstrom in 1997. Karlstrom later published a fully illustrated book entitled "Raimonds Staprans: Art of Tranquility and Turbulence"